SEE Barb PROFILED IN THIS Nserc VIDEO: "Canada's women in science"
To read program details and watch CIFAR's video, click here. CIFAR Announces new programs and chairs, click here to read. 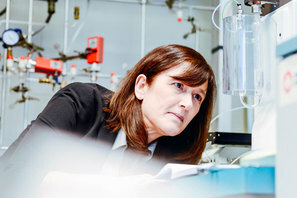 "Dr. Barbara Sherwood Lollar, University Professor in earth sciences, has won the prestigious 2016 NSERC John C. Polanyi Award for her pioneering research into billion-year-old water and the clues it may provide to ancient life on Earth and Mars. The award, named for the University of Toronto's Nobel laureate, honours an individual or team whose Canadian-based research has led to a recent outstanding advance in the natural sciences or engineering." To read the full U of T press ﻿article, click here. "For her revolutionary contributions to geochemistry, notably in the development of innovative mechanisms for groundwater remediation, and for her discovery of ancient fluids that hold implications for life on other planets." To read the full Globe and Mail press ﻿article, click here. 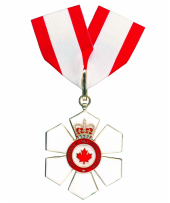 To read the news release from the Governor General of Canada, click here. Research on residence times of fluids within the crystalline basement using noble gases published in Geochimica et Cosmochimica Acta. Abstract: We show that fluid volumes residing within the Precambrian crystalline basement account for ca 30% of the total groundwater inventory of the Earth (> 30 million km^3 ). 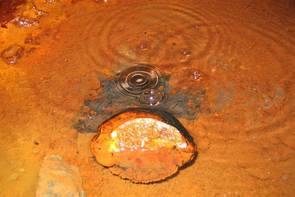 The residence times and scientific importance of this groundwater are only now receiving attention with ancient fracture fluids identified in Canada and South Africa showing: (1) microbial life which has existed in isolation for millions of years; (2) significant hydrogen and hydrocarbon production via water–rock reactions; and (3) preserving noble gas components from the early atmosphere. Noble gas (He, Ne, Ar, Kr, Xe) abundance and isotopic compositions provide the primary evidence for fluid mean residence time (MRT). Here we extend the noble gas data from the Kidd Creek Mine in Timmins Ontario Canada, a volcanogenic massive sulfide (VMS) deposit formed at 2.7 Ga, in which fracture fluids with MRTs of 1.1–1.7 Ga were identified at 2.4 km depth (Holland et al., 2013); to fracture fluids at 2.9 km depth. We compare here the Kidd Creek Mine study with noble gas compositions determined in fracture fluids taken from two mines (Mine 1 & Mine 2) at 1.7 and 1.4 km depth below surface in the Sudbury Basin formed by a meteorite impact at 1.849 Ga. The 2.9 km samples at Kidd Creek Mine show the highest radiogenic isotopic ratios observed to date in free fluids (e.g. ^21 Ne/^22 Ne = 0.6 and ^40 Ar/^36 Ar = 102,000) and have MRTs of 1.0–2.2 Ga. In contrast, resampled 2.4 km fluids indicated a less ancient MRT (0.2–0.6 Ga) compared with the previous study (1.1–1.7 Ga). This is consistent with a change in the age distribution of fluids feeding the fractures as they drain, with a decreasing proportion of the most ancient end-member fluids. ^129 Xe/^136 Xe ratios for these fluids confirm that boreholes at 2.4 km versus 2.9 km are sourced from hydrogeologically distinct systems. In contrast, results for the Sudbury mines have MRTs of 0.2–0.6 and 0.2–0.9 Ga for Mines 1 and 2 respectively. While still old compared to almost all groundwaters reported in the literature to date, these younger residence times compared to Kidd Creek Mine are consistent with significant fracturing created by the impact event, facilitating more hydrogeologic connection and mixing of fluids in the basin. In all samples from both Kidd Creek Mine and Sudbury, a ^124-128 Xe excess is identified over modern air values. This is attributed to an early atmospheric xenon component, previously identified at Kidd Creek Mine but which has to date not been observed in fluids with a residence time as recent as 0.2–0.6 Ga. The temporal and spatial sampling at Kidd Creek Mine is also used to verify our proposed conceptual model which provides key constraints regarding distribution, volumes and residence times of fracture fluids on the smaller, regional, scale. To read the full article in the February 2018 issue of GCA click here. Research on Sulfur Mass-Independent Fractionation Published in Nature Communications. Abstract: The discovery of hydrogen-rich waters preserved below the Earth’s surface in Precambrian rocks worldwide expands our understanding of the habitability of the terrestrial subsurface. Many deep microbial ecosystems in these waters survive by coupling hydrogen oxidation to sulfate reduction. Hydrogen originates from water–rock reactions including serpentinization and radiolytic decomposition of water induced by decay of radioactive elements in the host rocks. The origin of dissolved sulfate, however, remains unknown. Here we report, from anoxic saline fracture waters ∼2.4 km below surface in the Canadian Shield, a sulfur mass-independent fractionation signal in dissolved sulfate. We demonstrate that this sulfate most likely originates from oxidation of sulfide minerals in the Archaean host rocks through the action of dissolved oxidants (for example, HO· and H2O2) themselves derived from radiolysis of water, thereby providing a coherent long-term mechanism capable of supplying both an essential electron donor (H2) and a complementary acceptor (sulfate) for the deep biosphere. To read the full article in the October 27, 2016 issue of Nature Communications click here. The article "The Contribution of the Precambrian Continental Lithosphere to Global H2 Production" presents compelling evidence of a great underestimation in the amount of hydrogen present in the lithosphere. Abstract: Microbial ecosystems can be sustained by hydrogen gas (H2)-producing water–rock interactions in the Earth’s subsurface and at deep ocean vents. Current estimates of global H2 production from the marine lithosphere by water–rock reactions (hydration) are in the range of 10^11 moles per year. Recent explorations of saline fracture waters in the Precambrian continental subsurface have identified environments as rich in H2 as hydrothermal vents and seafloor-spreading centres and have suggested a link between dissolved H2 and the radiolytic dissociation of water. However, extrapolation of a regional H2 flux based on the deep gold mines of the Witwatersrand basin in South Africa yields a contribution of the Precambrian lithosphere to global H2 production that was thought to be negligible (0.009 × 10^11 moles per year). Here we present a global compilation of published and new H2 concentration data obtained from Precambrian rocks and find that the H2 production potential of the Precambrian continental lithosphere has been underestimated. We suggest that this can be explained by a lack of consideration of additional H2-producing reactions, such as serpentinization, and the absence of appropriate scaling of H2 measurements from these environments to account for the fact that Precambrian crust represents over 70 per cent of global continental crust surface area. If H2 production via both radiolysis and hydration reactions is taken into account, our estimate of H2 production rates from the Precambrian continental lithosphere of 0.36–2.27 × 10^11 moles per year is comparable to estimates from marine systems. To read the full article in the December 2014 issue of Nature, click here. "Deep fracture fluids isolated in the crust since the Precambrian" by G. Holland, B. Sherwood Lollar, L. Li, G. Lacrampe-Couloume, G. Slater and C. Ballentine. Abstract: Fluids trapped as inclusions within minerals can be billions of years old and preserve a record of the fluid chemistry and environment at the time of mineralization. Aqueous fluids that have had a similar residence time at mineral interfaces and in fractures (fracture fluids) have not been previously identified. Expulsion of fracture fluids from basement systems with low connectivity occurs through deformation and fracturing of the brittle crust. The fractal nature of this process must, at some scale, preserve pockets of interconnected fluid from the earliest crustal history. In one such system, 2.8 kilometres below the surface in a South African gold mine, extant chemoautotrophic microbes have been identified in fluids isolated from the photosphere on timescales of tens of millions of years. Deep fracture fluids with similar chemistry have been found in a mine in the Timmins, Ontario, area of the Canadian Precambrian Shield. Here we show that excesses of 124Xe, 126Xe and 128Xe in the Timmins mine fluids can be linked to xenon isotope changes in the ancient atmosphere and used to calculate a minimum mean residence time for this fluid of about 1.5 billion years. Further evidence of an ancient fluid system is found in 129Xe excesses that, owing to the absence of any identifiable mantle input, are probably sourced in sediments and extracted by fluid migration processes operating during or shortly after mineralization at around 2.64 billion years ago. We also provide closed-system radiogenic noble-gas (4He, 21Ne, 40Ar, 136Xe) residence times. Together, the different noble gases show that ancient pockets of water can survive the crustal fracturing process and remain in the crust for billions of years.